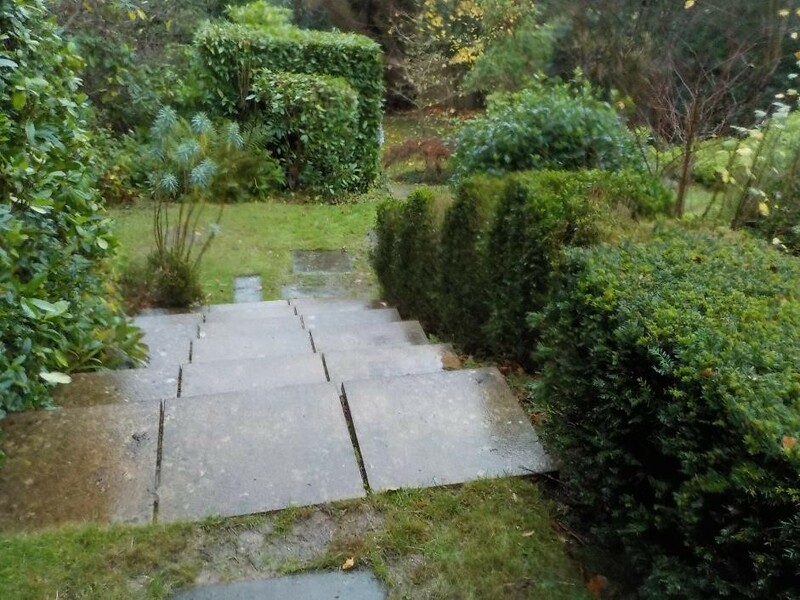 This was a steeply sloping garden that had been arranged into lawns on different levels and sloping garden beds dissected with several concrete slab steps. 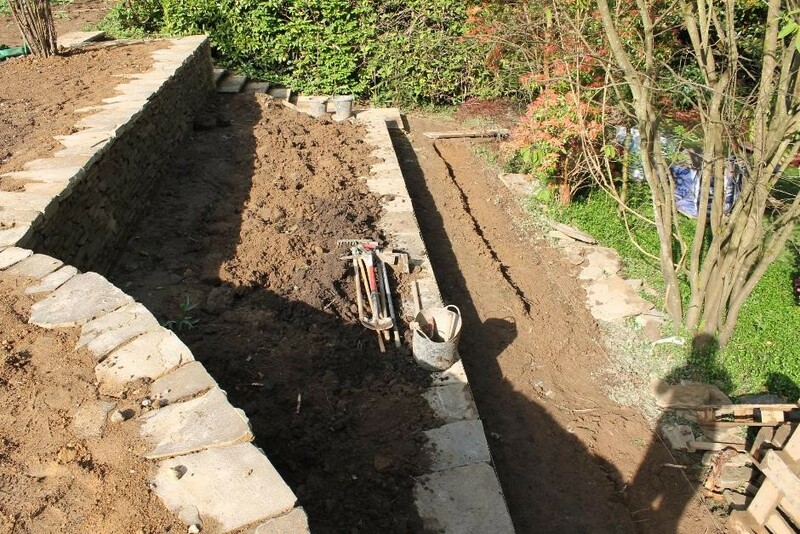 This layout was not entirely satisfactory to the client as it had no clear structure and the sloping beds were difficult to maintain. 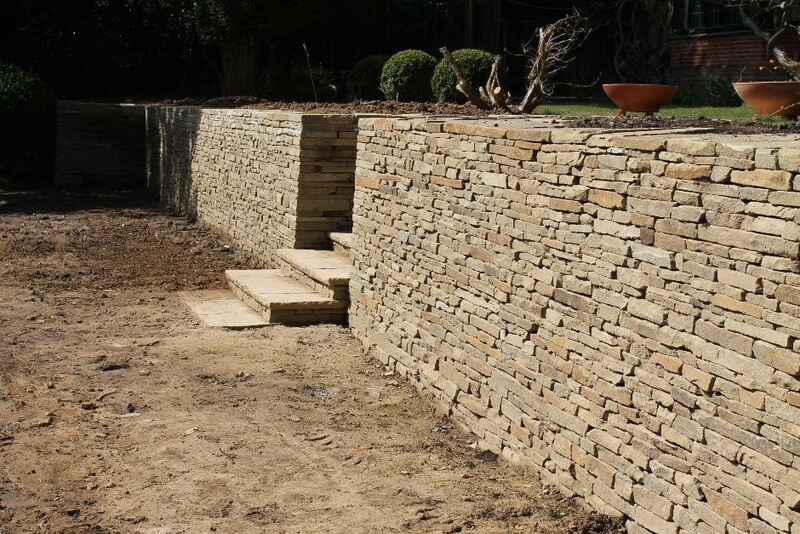 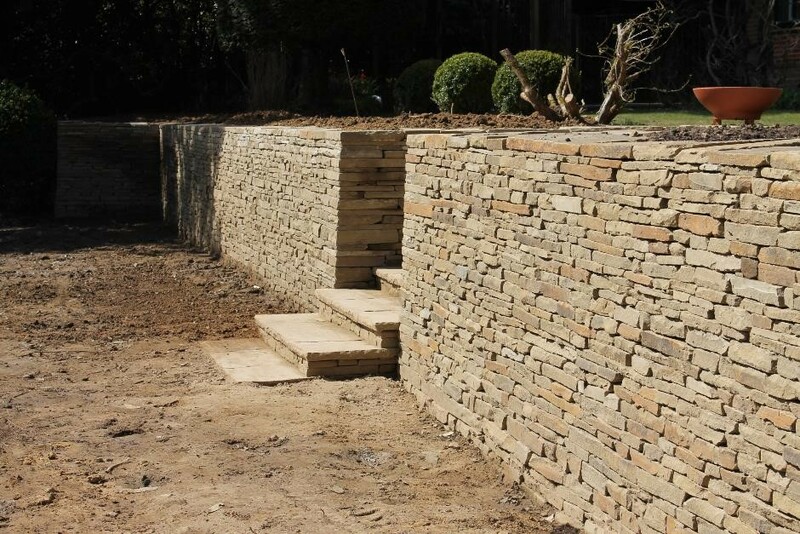 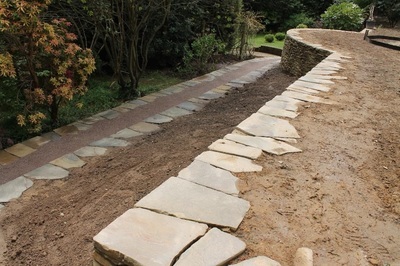 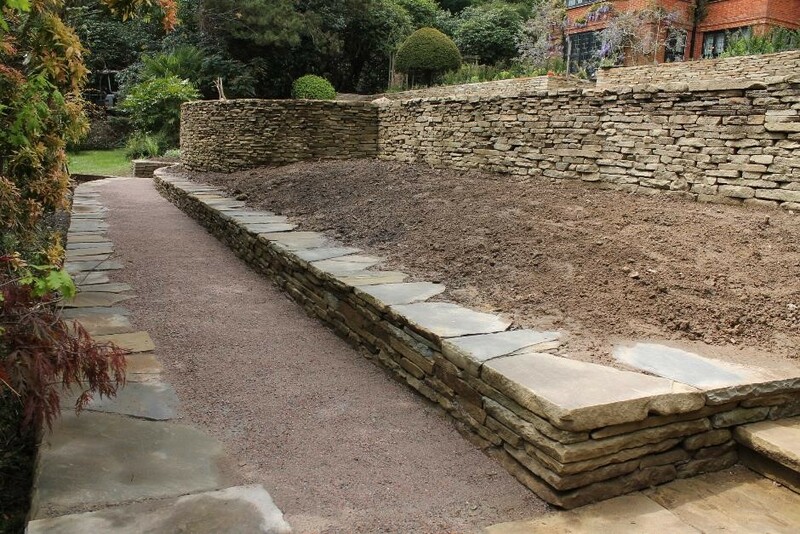 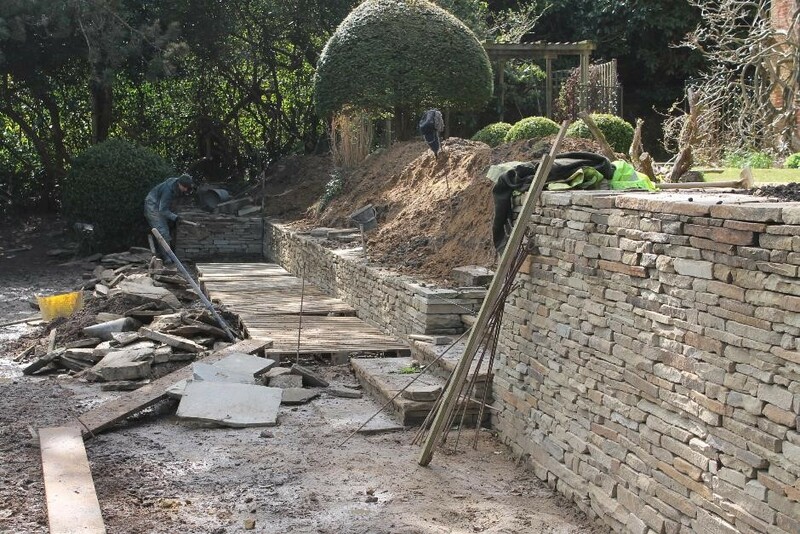 The general plan was to formalise the layout by putting in stone walls that would create flat planting beds and provide structure and also be a visually pleasing feature in themselves. 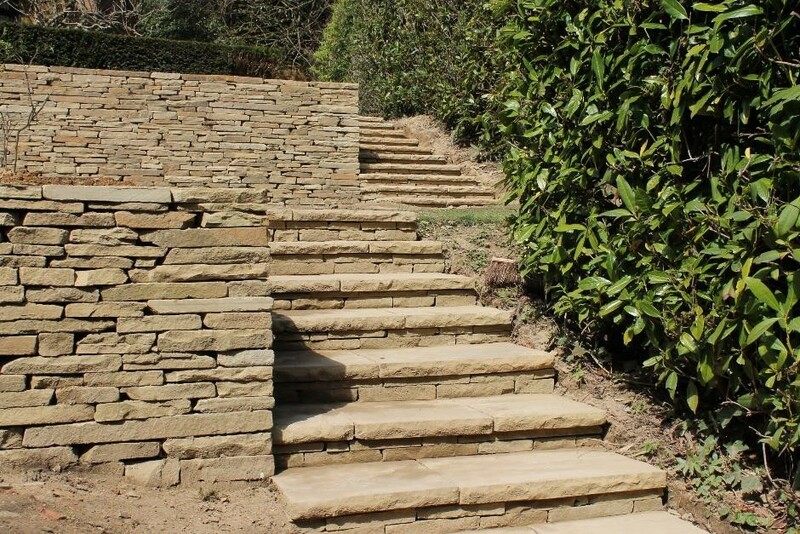 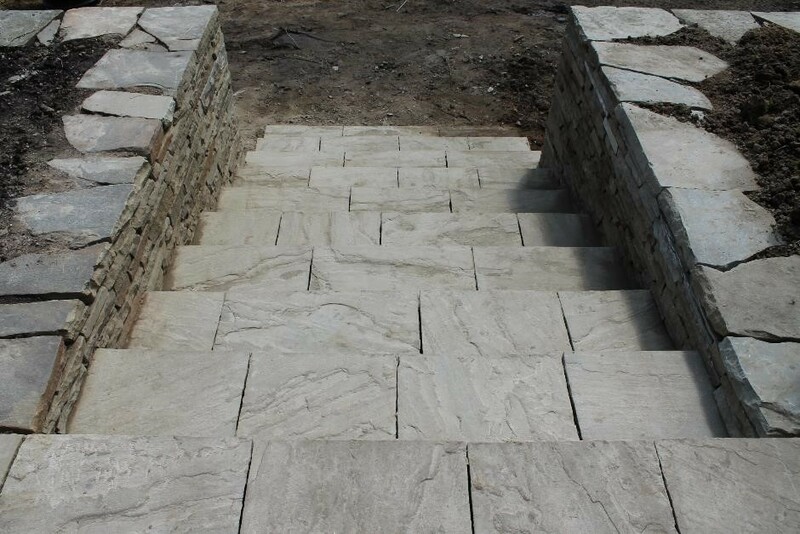 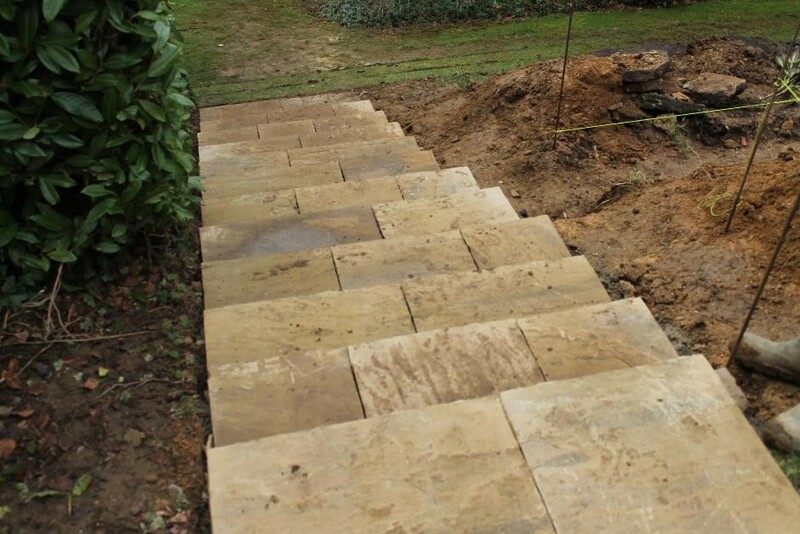 The concrete steps were to be replaced on a different layout with riven stone York flag staircases that would be a stunning feature and also provide grip underfoot as sawn stone can be slippy when wet. A lot of the beds had to be mostly cleared of plants because there would be much moving of soil and also it would then give the opportunity to totally re-plant. The first jobs were to strip out the garden and pull up the old staircases and prepare the foundations for the large semi-circular bed and lower wall. 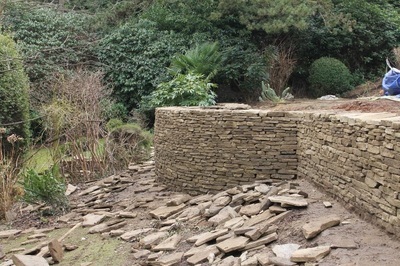 All the stone was delivered to the property and wheel barrowed to the building area. 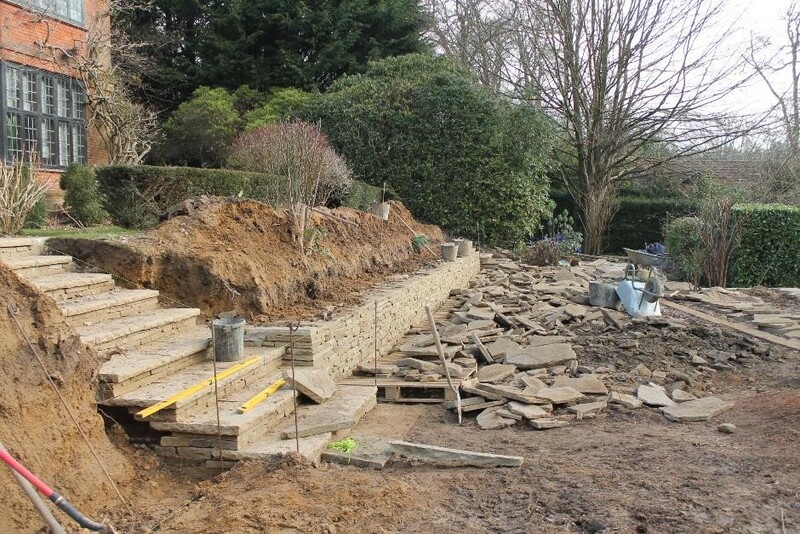 We started by concentrating on the lowest staircase and then building the lower retaining wall of the garden. 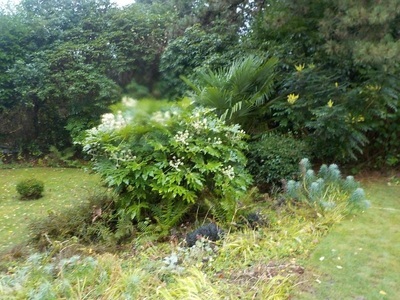 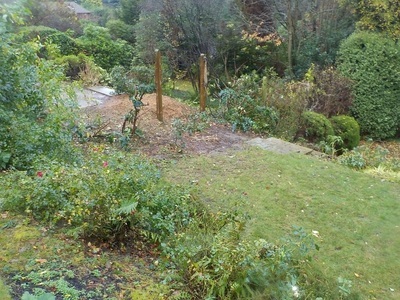 This included a large semi-circular planting bed that was around head height at its tallest point. 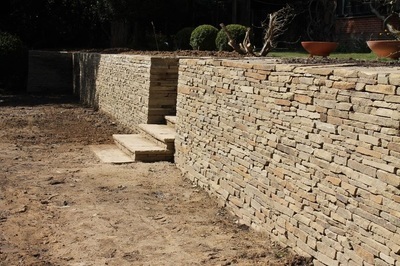 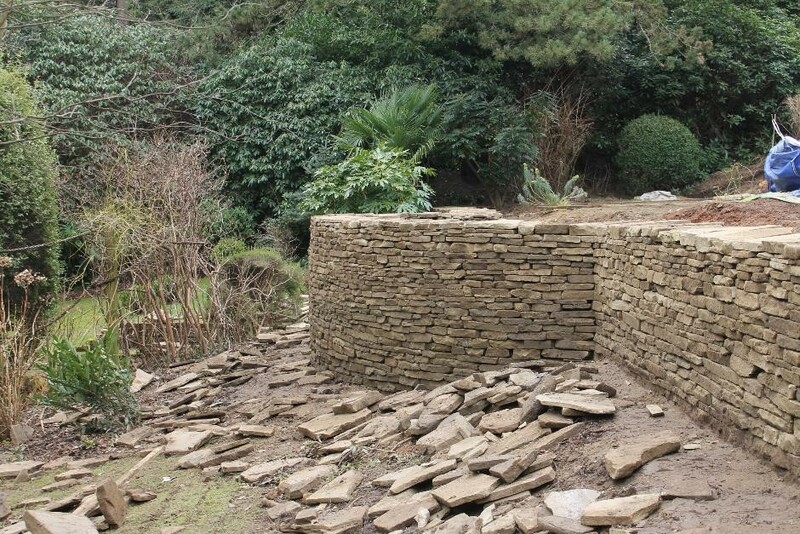 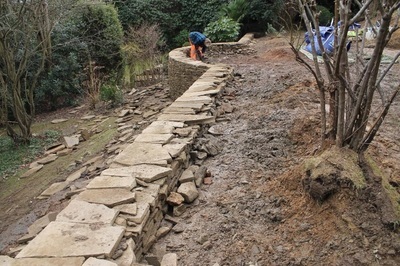 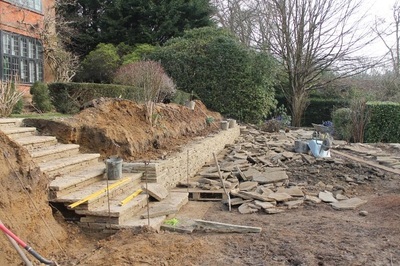 We then moved onto the upper part of the garden, which involved digging back a large sloping earth bank and then building a tall stone retaining wall that would then create two level tiers. 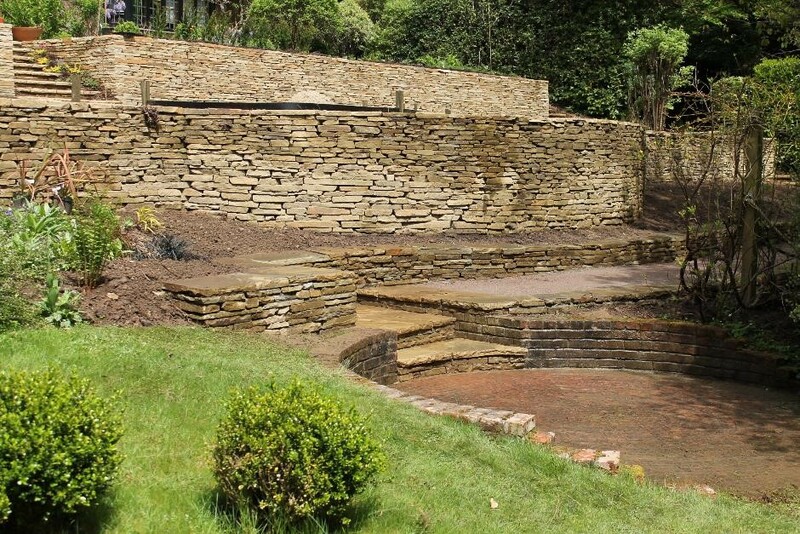 Much of the excavated soil went into the space created by building the lower wall and the large semi-circular bed. 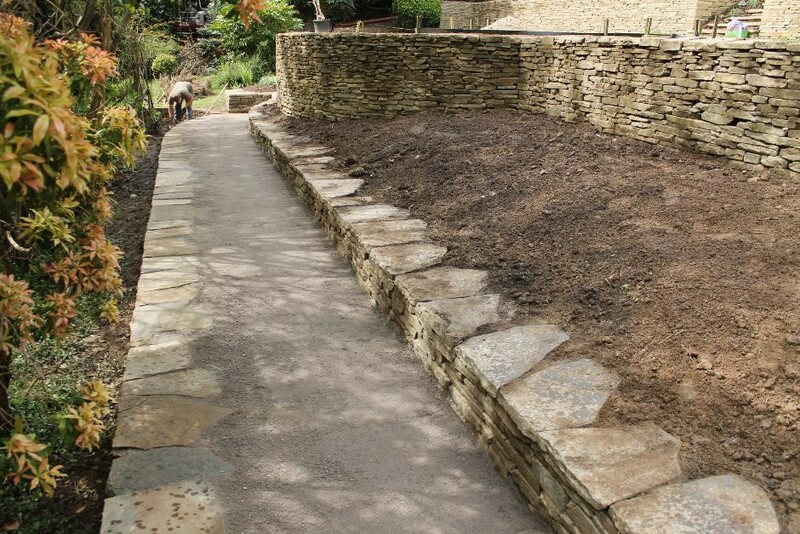 After most of the walls and staircases were built, we returned to finish off the lowest part of the garden in order to create another sloping bed, lengthen some of the stairs and link up the different parts of the garden with steps and a large stone pathway area filled with eco-gravel.